When many people think of coffee gear, they picture the classic diner coffee maker or large electric grinders. However, recent decades have given way to a new wave of specialty coffee gear. Specialty coffee focuses on the taste and artisanal craft behind the brewing process. The most popular home brewing methods are categorized as pour over brewing and immersion brewing. This form of coffee is hands on. 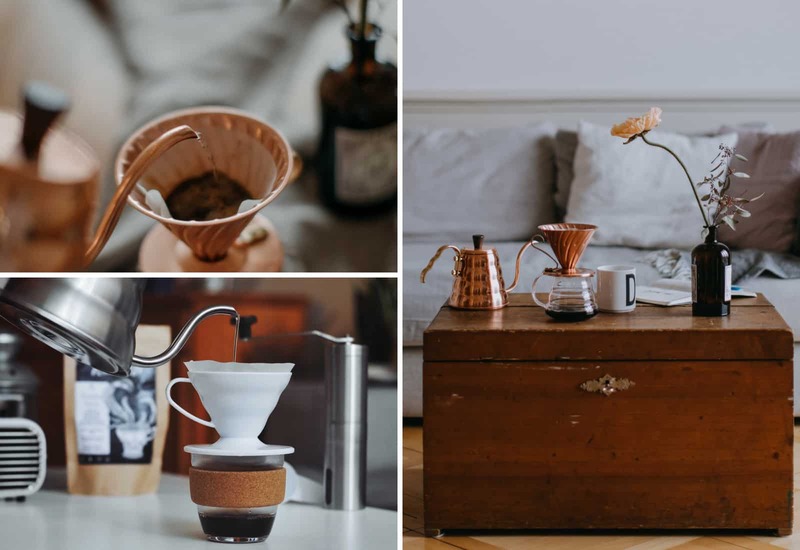 Brewing skill and technical coffee knowledge are valued assets in the specialty coffee world - which is why many wish to know what the best pour over coffee maker is. The Bee House Dripper is a fantastic and reliable piece of gear. 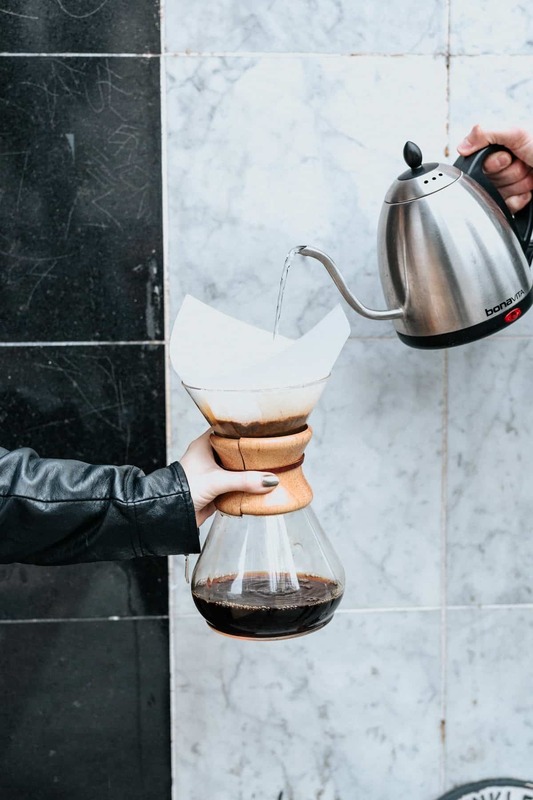 If taken care of, this ceramic pour over method will last forever. The ceramic build aids in heat retention, and it is a bit more durable than glass. Like most pour over drippers, the Bee House sports a conical ridged design. This design, however, is a bit different than many popular drippers. The device uses the standard Melitta filter (available at most grocery stores), and because of this, it features a wedge-like design. The fact that this dripper uses Melitta filters is extremely useful. Most of the popular pour over methods employ their own exclusive filters. While custom filter types do allow for ergonomic and intentional design, they aren't readily available. Melitta filters are available almost everywhere, so running out is never an issue! The Bee House is designed for all experience levels. During the brewing process, the coffee is decanted through two small holes. This design allows for a consistent flow rate, eliminating "clogs" or slow decanting times. The Bee House is a solid decision for any level of barista - especially the newcomers. The Bee House uses a common form of paper filter. It's a user-friendly brew method - offering forgiving brew results. It's a bit heavy and not exactly portable. Dr. Peter Schlumbohm crafted this beautiful piece of glassware in 1941. He focused on aesthetic, utility, and efficiency. Many people are entranced with the scientific nature of specialty coffee, and the Chemex provides just that. Not only does it provide the user with control over brewing parameters and variables, but it is an aesthetic addition to any counter top or kitchen. The Chemex is another versatile and forgiving pour over method. If you are inexperienced, there's no need to be intimidated. At first glance, the Chemex appears to be a carafe with a large hole in the center. At one side of Chemex is a ridged spout, and the other side usually features a glass handle. Part of the magic behind this brew method is the Chemex double bonded filter. Due to the micro fine paper design, the coffee is extremely clean once brewed. The paper "catches" many of the small coffee particles that usually make it into your cup. 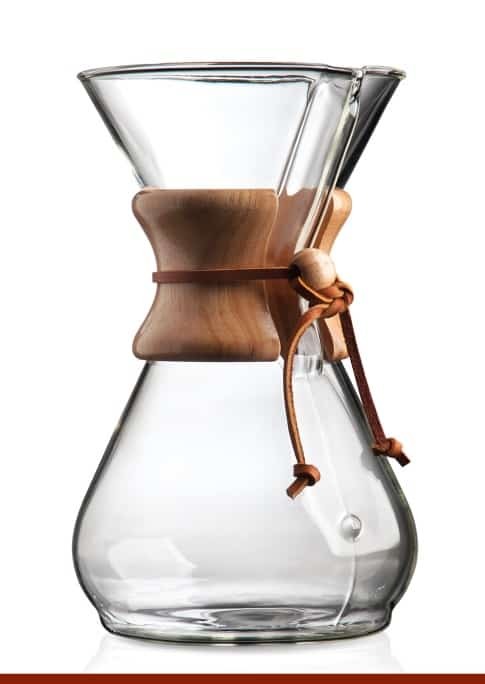 Clarity and cleanliness are two qualities that the Chemex boasts. Specialty coffee, much of the time, is brewed using a one or two cup process. Pour over methods are typically smaller and can only support small batch volumes. Unlike single cup brew methods, the Chemex is a great "party" brewer. Many servings can be brewed all at once. As mentioned earlier, brew parameters are easily manipulated with the Chemex. The top half of the glassware is large enough to incorporate a variety of techniques. Stirs and pouring experiments can be performed with ease. The Chemex is both aesthetically pleasing and ergonomic. It has a large brew volume capacity. The filters can be pricey. If you frequent any craft cafes or specialty shops, you've probably come across this brew method. The V60 is a popular choice for professional and home baristas alike...and for good reason. Hario developed this to be the ultimate coffee dripper. The design is intentionally engineered as an efficient alternative to many pour over systems. When brewing, the coffee drips along the sides and through the opening. This water flow distribution makes the V60 one of the fastest quality brewers on the market. The flow distribution promotes speed as well as a balanced cup. Difficult to use for a novice home brewer. Unforgiving brew mistakes. Abid's Clever Dripper is in fact, a "clever" mechanism. The Clever Dripper is without a doubt, one of the simplest ways to brew a cup of coffee. Everything about this brew method screams utility, cleanliness, and quality. This efficient brewing method is of the conical wedge variety. This wedge design, like the Beehouse Dripper, is designed for its use of Melitta filters. Melitta filters can be found in most grocery stores, so you never need to worry about running low on inventory. The plastic conical design is exemplary. The Clever Dripper is both aesthetic and durable. 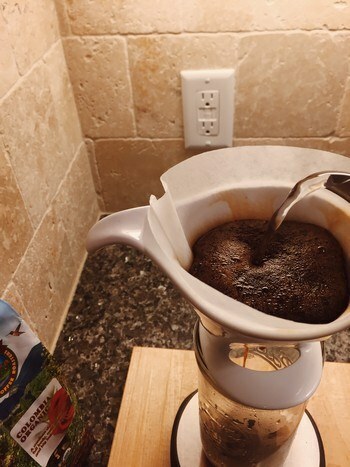 Most pour over methods are pretty sturdy, but the Clever Dripper is near indestructible. Just don't throw it at a wall. The brewing process is simple. Insert your Melitta filter, pour in your ground coffee, and pour your desired volume of water. When the desired brew time has been reached, set your clever on a decanter or mug. This will trigger a release valve at the bottom of the brew device. The Clever Dripper is a bit different than the other methods we are reviewing. Technically, it is classified as a full immersion brew technique. The coffee is completely submerged in water, resulting in a full bodied, juicy cup. Simple brew process that allows for manipulation of brew variables. Bodum makes good things. The company proves themselves time and time again. Which is why we are excited to feature this Bodum designed pour over. This coffee maker is the classic Bodum product: good quality, intentionally engineered, aesthetically pleasing, and useful. The design is slightly akin to a Chemex, but it's a bit rounder looking. Its mouth blown borosilicate glass is another classic Bodum feature. Borosilicate glass is thermal shock resistant and you can rest assured that shattered glass won't decorate your kitchen floor. ​The top half of the carafe shaped glass is occupied by a steel mesh filter - which is a very useful feature. If paper isn't your style, this easy, clean and reusable filter will suit you well. Steel filters brew full bodied cups of coffee. Clarity and cleanliness are substituted with a full bodied mouthfeel. 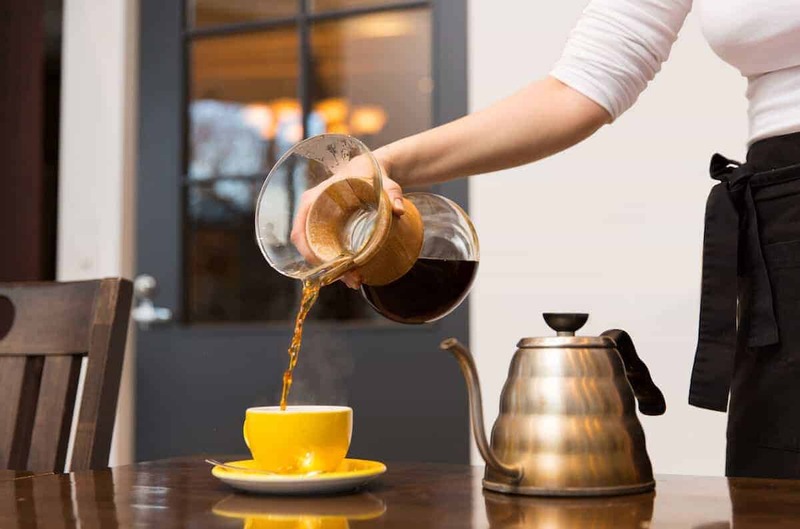 While Chemex brews clean and flavorful coffee, the Bodum pour over Coffee Maker will brew a thicker, rounder cup. Contains extra features (detachable carafe and metal filter). There are quite a few extra features to keep track of. For those of you who enjoy crafty and simplistic wood design, Osaka is the direction you should take. The sum of this pour over dripper's parts makes it an ergonomic addition to anyone's coffee routine. Osaka is also crazy about beautiful wood design, offering you different colors when choosing your dripper. Osaka makes a variety of paperless products. Their brewers boast the preservation of coffee's natural oils. Instead of relying on paper to filter out colloids and coffee particles, they developed a double mesh filter. This conical filter brews coffee that has a rich, full-bodied mouthfeel. The brewing process is simplified, as clean up and brewing is made simpler and easier than with most brew devices. Like the Bodum pour over Coffee Maker, Osaka designed their dripper with borosilicate glass (It is thermal resistant, odorless, and durable). The carafe is made to be detachable, so it's possible to use this decanter for other coffee or cooking activities...due to the beautiful wood handle, you'll probably want to use it for everything. Coffee Gator focuses on the good things in life: keeping our environment healthy, being cool, and brewing good coffee. Coffee Gator's pour over coffee maker is another all-in-one brew method. Like the Bodum pour over dripper, and the Osaka pour over coffee dripper, Gator's dripper employs a detachable stainless steel filter. This allows the user to use the carafe/decanter for any other kitchen/coffee related activities. You're essentially buying two useful tools for the price of one. Once again, these metal filters brew your coffee just right. The brewed coffee characteristics can be described as full bodied and boisterous. Purchasing paper filters can now be a thing of the past. The paperless option for professional or home brewing is the barista's dream. Gator's pour over dripper's design is similar to that of the Bodum pour over dripper and the Chemex - except that it's a 10oz size. The savvy little brewer is perfect for those that enjoy a simple one cup brewing process. The cool thing about the Coffee Gator company is that they give their customers a satisfaction guarantee. Trying out this sleek brewing device is 100% risk free. Even though the product speaks for itself, Coffee Gator extends its trust to its customers. Comes with carafe and metal filter. So what really is the best pour over coffee maker? That's up to the user. Everyone is different, and different people have different needs. Specialty coffee brewing is experimentation, dedication, and enjoyment. Any one of these brewers will provide you with a sense of ownership and craft in your coffee. Good info on lots of options. Especially like the pros and cons tips. Still deciding but your article has helped me a lot. Thirty years ago I had a clunky old metal pour over that made the BEST coffee. I got tired of electric coffee makers ad lousy coffee and bought a pour over. A Bodum. The price was pennies compared to electric pots I paid a fortune for. I am in coffee heaven!! It is slightly more hands on but SOOO worth the effort. no more bitter coffee, no sludge on the bottom of pot, easy clean AND a great cup of coffee every time.